NFPA's Hot Work Safety Certificate Program was created to help those in the construction industry develop awareness and understanding of dangers and safety procedures to promote safety on the work site where hot work occurs. Whether you are verifying compliance with local mandates, or are looking to demonstrate that you/your staff are committed to the highest level of safety standards, enroll in the NFPA Hot Work Safety Certificate Training Program. 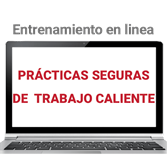 Hot Work Safety Certificate Online Training is vital for anyone responsible for hot work. *NFPA’s Hot Work Safety online training has been awarded a Gold Brandon Hall Excellence in Learning Award. 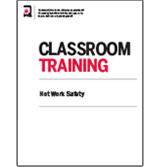 Hot Work Safety Certificate Classroom Training is vital for anybody involved with hot work. Check our database to verify a NFPA Hot Work Safety Certificate. Every job site involving Hot Work requires a permit to document the hazards and the safeguards in place to ensure the planned hot work does not cause a fire. Where required by your AHJ, use this fillable PDF form to complete and submit your AHJ Hot Work Permit application electronically – saves time printing and scanning! This form can also serve as the on-site permit completed by the hot work contractor and posted at the site to advise workers in the area that hot work is being performed at the job site. This form was created to facilitate electronic completion and submission where required to obtain an AHJ permit. It may or may not meet your jurisdictions requirements for hot work permit application. Please check with your local authority. Why Should I attend a Hot Work Safety Certificate Program training? 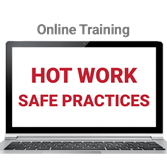 Hot work contributes to fires throughout the country, and this training addresses the safe practices needed when planning and executing jobs wherever hot work processes are used. Attending this training demonstrates your commitment to the highest safety standards. It is mandatory in Boston currently and will be in all of Massachusetts as of July 1, 2018. NFPA's Guy Colonna and Laura Moreno discuss what you need to know about hot work safety. For Online Course and Exam: After completing the online class and exam you will receive immediate notification of your pass/fail status and access to your certificate online. You will also be able to obtain your certificate at any time in your NFPA profile by logging into the NFPA website.  For organized labor in Boston:Your Local Administrator will let you know if you passed the assessment and will provide your Hot Work Safety Program Certificate once this information is received from NFPA. This training is provided by instructors who have been trained by NFPA, and it is now also available in two formats - classroom and online. NFPA has created a hot work infographic for you to use on your website, blogs, Facebook and Twitter. Just download the graphic and place wherever you want to use it. Hot work fires are preventable. 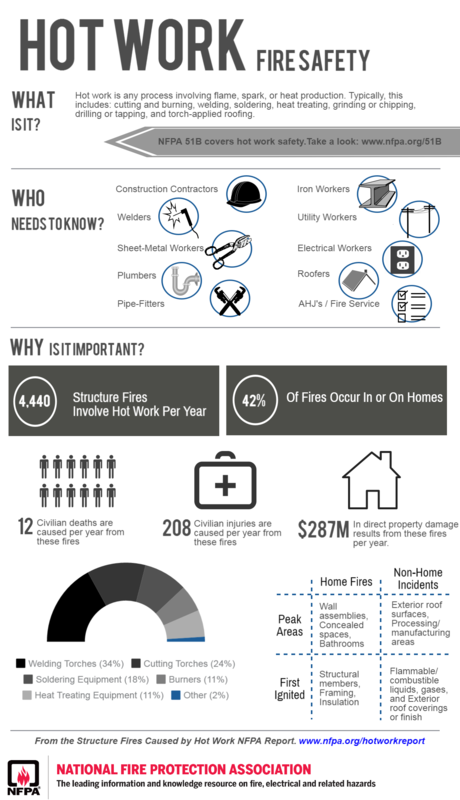 If you are an NFPA member, you can download our fact sheet on hot work safety. This fact sheet is also available in Spanish below.